Are you – or your kids – looking for something beyond the chicken nuggets, cheeseburgers and other staples of children’s menus? 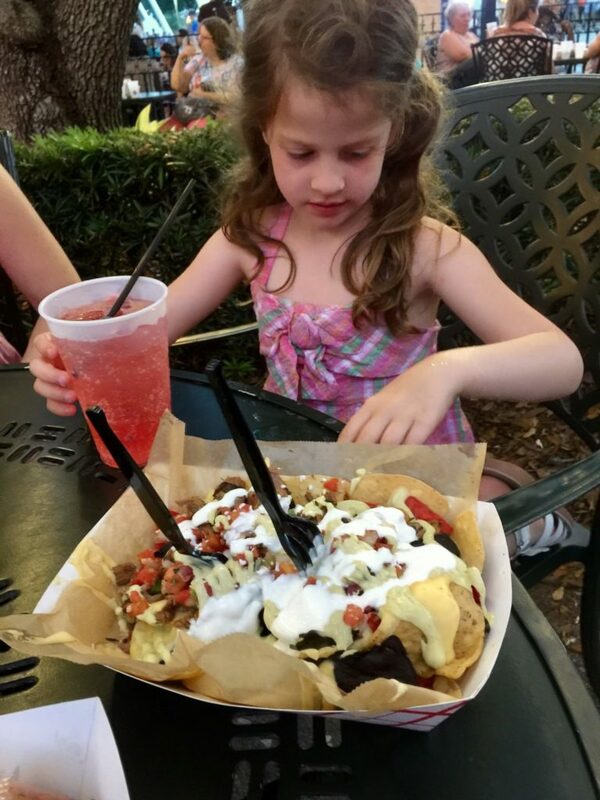 Then check out these recommendations, our favorites from the Disney Springs kids’ menus. Then head over for great shopping, unique activities, and some of the best food for kids at Disney Springs! I appreciate his focus. After all, he’s a consummate foodie, always planning dinner while we’re still eating lunch. And I appreciate his excitement – after all, Walt Disney World is known for its delicious dining experiences, which are almost as renowned as the Mouse himself. 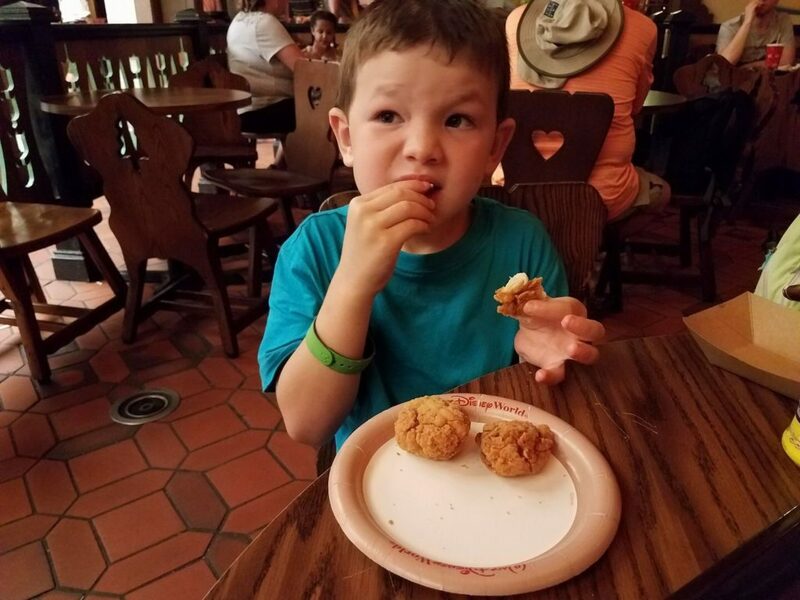 Until recently, my children didn’t echo his excitement for the Disney meal experience. After all, kids’ menus looked pretty much the same – all chicken nuggets and burgers, hot dogs and mac and cheese. Nothing to get excited about here (especially for our youngest, who is a vegetarian). Given the choice of trying a new restaurant or going on the rides at Disney, park time trumped yet another personal pizza every time. But times have changed – and so have the children’s menus at Disney. Of course, you’ll still be able to find the old standards. They’re standards for a reason, after all. But if your child’s palate has matured beyond grilled cheese and fries (or he’s just tired of the same old same old), head over to Disney Springs. The four “neighborhoods” in this sprawling remake of Downtown Disney offer a surprising variety of menu items for even the youngest Mouseketeer. With a variety of dining experiences ranging from high end gourmet to kiosks and food trucks, Disney Springs certainly offers something for everyone. And that includes every kid! Here are our favorite eclectic choices of food for kids at Disney Springs, by area. 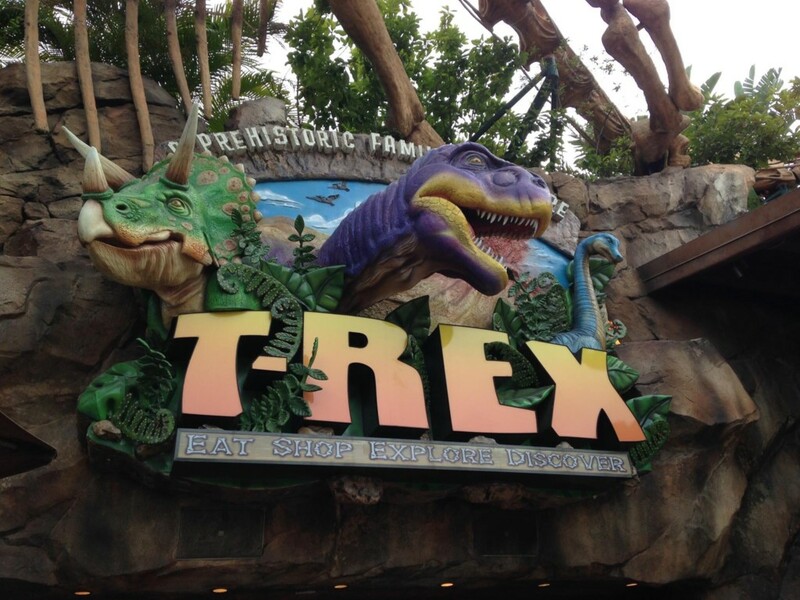 Similar to the Rainforest, T-Rex is also about motif – this time, a prehistoric one. Dinosaurs surround you and watch your every move. Their kids’ menu is also similar, but there’s the addition of Lava Lasagna. Yum! Kids also go crazy over the T-Rex character cup – a blend of Icee flavors, frozen and served in a souvenir cup. Irish eyes are smiling at Cookes of Dublin – and your kids will, too, when they see the menu! Along with the regular fare (burgers or chicken tenders – not nuggets! – this time), authentic fish and chips are part of the cuisine offered to kids. Morimoto Asia is a signature dining experience, which means it will cost those of you on the Disney dining plan 2 Table Service credits. So, what does the famous Iron Chef serve up for the kids? They’ll get to choose from Lo Mein (Cantonese noodles tossed in butter), Menchi Catsu (a panko-fried ground beef patty) and Karaage Drumettes (fried chicken, Japanese style), among other delicacies. Taking the prize for fun eating is Paradiso 37, which is heavy on finger food. Yes, that means hot dogs, mini cheeseburgers and chicken fingers. But it also means chicken or beef crispy corn shell tacos, served with cilantro rice and black beans. Want Italian – but the kids want more than pizza? Then try Portobello Country Italian Trattoria. Their extensive kids’ menu includes grilled steak, fresh fish, grilled chicken and spaghetti with a variety of toppings. And yes, there’s pizza too, for that one kid who never orders anything else! Best naming of kids’ menu items? The award goes to Raglan Road. After all, what kid can resist foods like Silly Steak (5 ounces of steak, complete with onion ring) or Ham Nom Nom (honey glazed loin of bacon served with colcannon potatoes and savoy cabbage)? Their menu also includes Yummy Risotto, Salmon Savoy and Young Shepherd’s Pie. Are you sure this is a children’s menu? A kids’ menu featuring quesadillas, chicken enchiladas and tacos? Point me in the direction of Town Center and Frontera Cocina, where the children’s menu features these Mexican specialties. Chef Rick Bayless, host of PBS’ “Mexico: One Plate at a Time,” design his menu with authenticity in mind – and he didn’t forget the kids! The kids menu at Bongos Cuban Café doesn’t sound particularly authentic, but it does offer some choices I haven’t seen elsewhere on Disney property. Of particular note is the kid-sized Palomilla Steak. Those littles with small-but-adventurous appetites can also choose Ham Croquettes or Mariquita Chips, both offered on the kids’ appetizer menu. Who doesn’t like a barbecue? That’s what The Smokehouse is all about. And yes, like at all BBQ’s, the offering for kids is heavy on beef hot dogs and baked beans. So why did this make the list? Well, check out their Mini Smoked Pulled Pork Slider especially for the 9 and under set. Now who’s your pit boss? Sushi on a kids’ menu? Leave it to the Wolfgang Puck Grand Café. Kids can choose between California rolls and Crispy Chicken Finger rolls (a gourmet nod to the standard nuggets, no doubt!) If your little prefers her fish cooked, there’s a kid’s salmon on the menu as well. Dessert time? 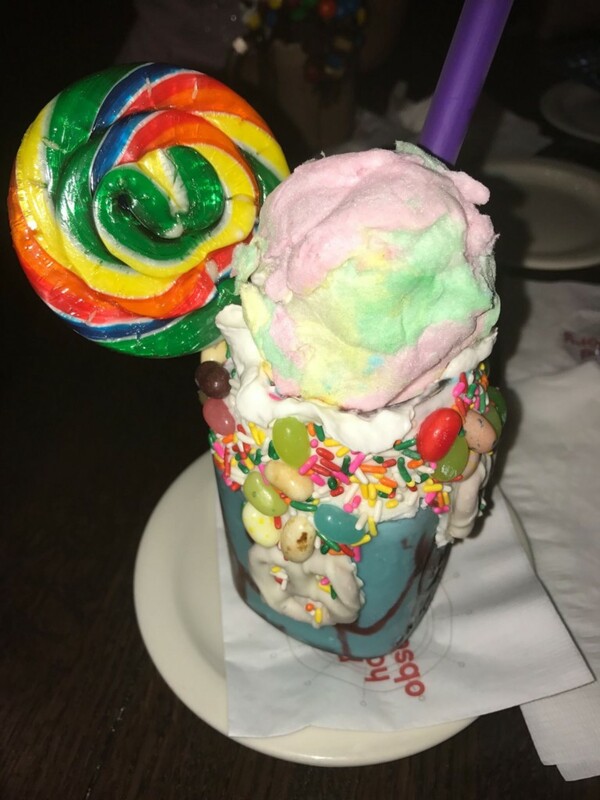 Check out this kid-friendly milkshake at Planet Hollywood. Photo by Jenn Greene, Last Minute TravelingMom. Yes, pretzels are usually a snack food. But at Wetzel’s Pretzels (Marketplace and West Side), your hot dog lover can try a cheese dog or pretzel dog, for a new twist on an old favorite. Not exactly Disney Springs, but the closest thing to it….the Wyndham Lake Buena Vista offers a Disney character breakfast three mornings a week. Located in easy walking distance to Disney Springs, the breakfast buffet – with real Mickey waffles, an omelet station and a variety of other choices – is one of the best buys in the area. Come late, and make it a brunch! The menu at the Planet Hollywood Observatory is standard kids fare at best. But the specialty drinks for kids here are out of this world. Maybe the kids can be bribed to eat one more cheese pizza, if they’re washing it down with a Shooting Star (strawberry puree with pineapple and apple juices) or a Mars Attack (coconut and strawberry puree garnished with fresh blueberries). 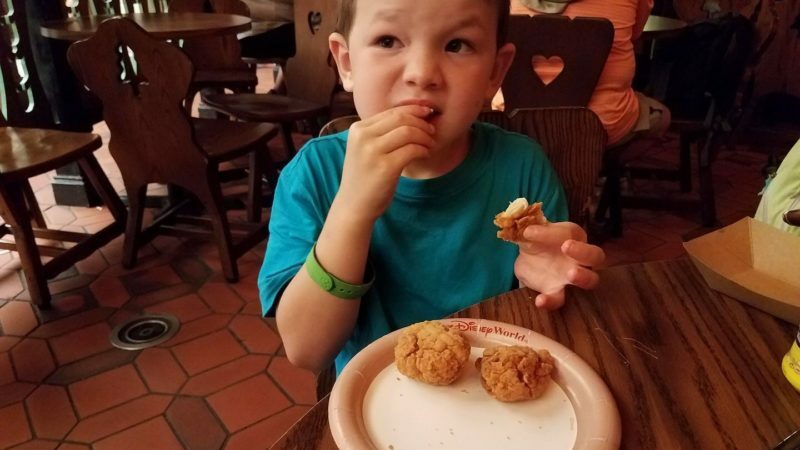 How adventurous do your little eaters get at Disney? Share your favorites here!